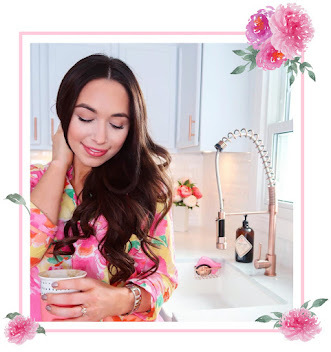 I'm so excited to be sharing my favorite skincare products with you! I've tried more products that I even want to admit haha. With so many products out there, it can be difficult to find something that works and is worth the money. 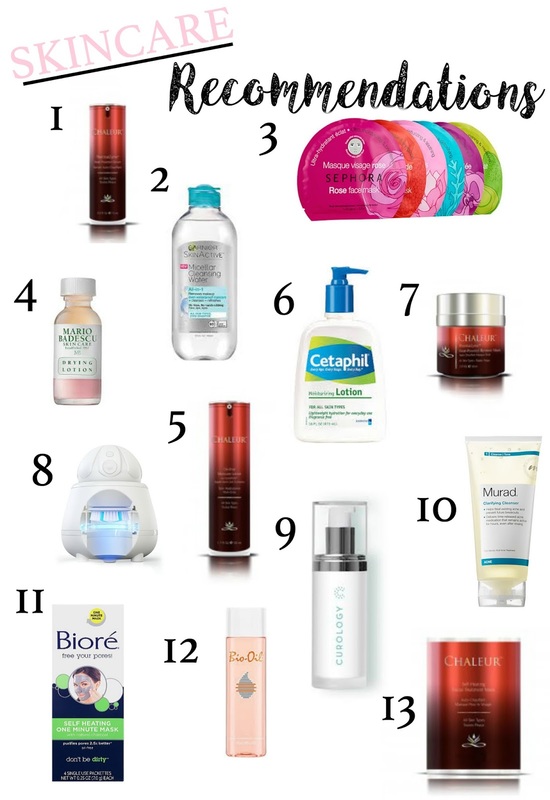 All of these products I truly love, and almost all I have repurchased many times. Whether you're looking to clear acne, even out your skin tone, or prevent aging, there's something here for everyone. I should also note my skin is sensitive, combination, and occasionally acne prone. I hope you find some amazing products you're excited to try in today's post. Happy shopping! This serum is one of four Chaleur products that I've been trying out. They are heat-activated from the warmth of your body! How cool is that?! This serum firms, brightens, and improves skin tone, texture, etc! I could literally go on and on, but you can view more product info above my clicking on "one". If you're looking for a new serum to try out, you can't go wrong with this one! If you are a makeup removing towelette person, you need to give this a try! I used towelettes for years, and was hesitant to switch over. This is 100% a game changer when it comes to removing makeup. I wear a lot of makeup, and in one wipe it removes almost everything! I also LOVE this for removing my eye makeup. It dissolves lash glue really quickly, making my falsies last so much longer than before. Plus, my skin feels hydrated after my makeup is removed. Towelettes always leave my skin feeling stripped, so I don't plan on going back to them! Sheet Masks are one of my favorite things! I also describe myself as a "sampler platter" kind of person haha. I love to try new things and having options in one set is just so fun to me. This set also has a great price point, and includes 6 different masks! Such a steal. I can't say enough good things about this spot treatment! Most importantly, do NOT shake this! It's supposed to be separated. You stick a Q tip straight down into the product, then apply to any blemishes. It dries light pink and chalky, so this isn't a daytime/apply then leave the house kind of treatment. Usually, most people only use this at night and wash it off in the morning. It does have a strong smell before drying, but it is SO effective. I also love how you can buy it in either a plastic bottle or glass (same price). This oil-free moisture lotion has Lumi Firm Apple Stem Cell Complex and delivers time-released hydration. It's lightweight, absorbs quickly, calms sensitive skin, and diminishes the appearance of fine lines and wrinkles. I love that it has something to offer everyone, regardless of your age and skin type! This lightweight and affordable moisturizer has been a go-to product of mine for several years. It's great for sensitive skin, and I use it on my whole body! If you need something more affordable you should definitely check this out. This renewal gel mask fights photo aging by protecting your skin against UV and IR free radicals. It hydrates, energizes, and helps repair skin damage. 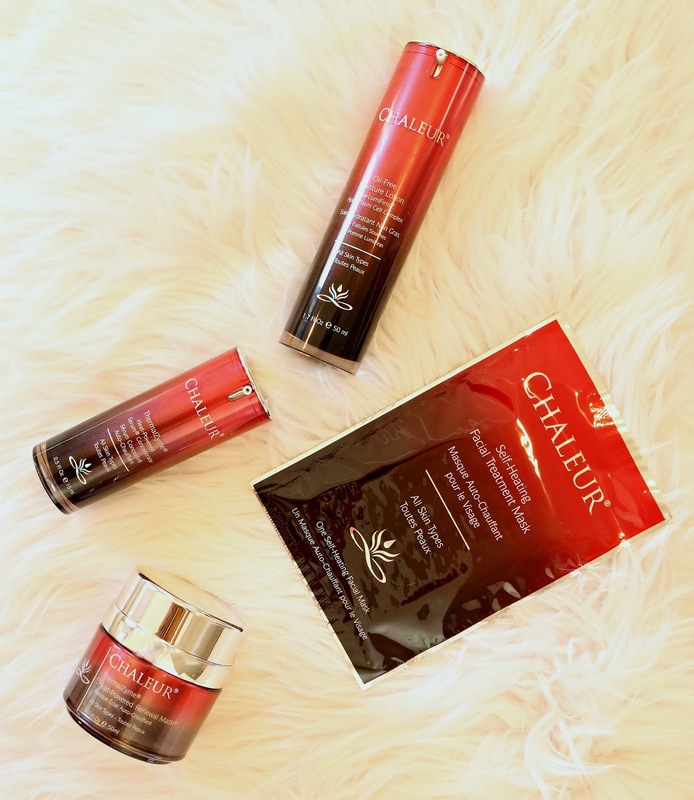 Like all of the Chaleur products in this post, it is also heat-activated. Products like this are on the top of my list lately. I love how calming and effective heat-activated products are! Facial brushes are definitely one of my top must-haves when it comes to skincare. They clean so much deeper than you can with your hands alone. I typically use mine at night when I need to remove makeup, and keep it simple with just my hands in the morning. The best thing about this product is the station it sits in. It removes 99.9% of germs from your brush! The station also turns back on periodically to get rid of any germs that have come back to your brush. I've never heard of anything like this before, and I think it's just the coolest thing. I've talked about Curology on my channel a few times, and nothing has cleared up my skin like this has. You can get your first month free, and cancel if you don't like it (so 100% free) here. Curology isn't just for clearing acne, they help with just about anything (anti againg, uneven skintone, etc). I can't believe how quickly this clears up my skin, and without drying it out! This is personalized skincare, you send them photos of your face and they will tell you what you need. If you are struggling with acne, you absolutely need to try this. For anyone with moderate acne, this Murad cleanser is a must. I also love how it helps to keep oil away, so you'll need to blot less often throughout the day. It contains time-released medication, so it will continue to fight breakouts throughout the day. They also have a 30 Day Starter Kit of their entire line. This has a great price point, and I really recommend it before purchasing full size products so you can see how it works for your skin. For anyone looking for an affordable charcoal mask, you need to try this! It comes in a pack of 4 and provides you with a quick one minute heat-activated mask. These are great for when you need to give your skin a boost, but don't have much time. Right now they're buy one get one 50% off here! Bio-Oil is one of my favorite products of all time. It's cheap, and extremely effective. What more could you want?! I use this just about every night to help even out my skin tone, fade acne scaring, and for added hydration. Since it's an oil, I don't recommend it during the day because it will leave you looking shiny. You can also use this on stretch marks! I can't get over how much I love these masks! They're so luxurious and high quality. Water activates these masks to provide you with 20-30 minutes of penetrating, relaxing heat and hydration. This mask softens fine lines and wrinkles, encourages deeper migration of your skincare ingredients, and promotes a healthy glow. You can buy a 4 pack here, or a single mask here. I seriously feel like I just left a spa after using these masks. They're a must have! Thank you for reading today's post, I hope you found some new products you're excited to try! You have some awesome recommendations! 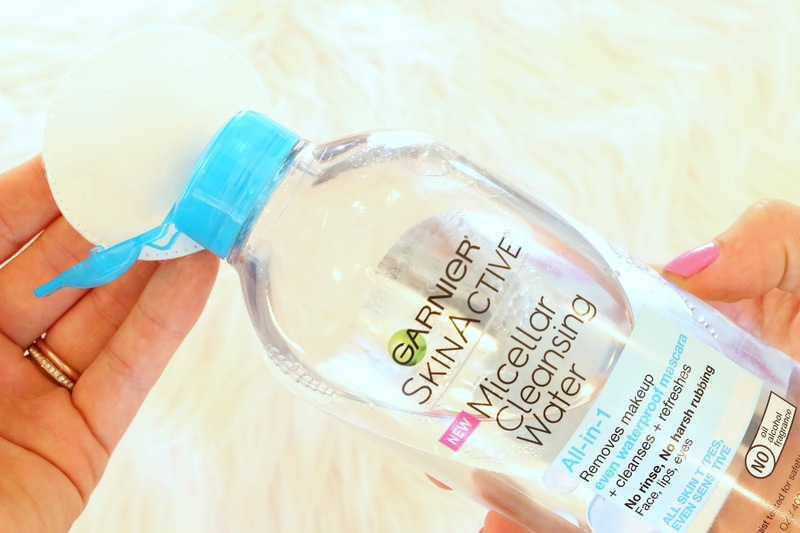 I really want to try that Garnier cleansing water!